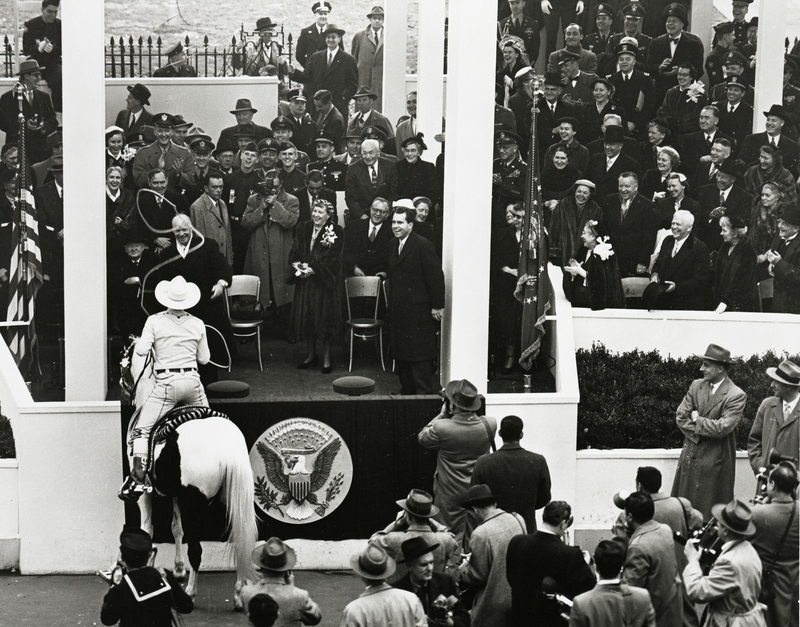 SCVHistory.com LW2383 | Film-Arts | Montie Montana Ropes Ike at Inaugural Parade, 1953. 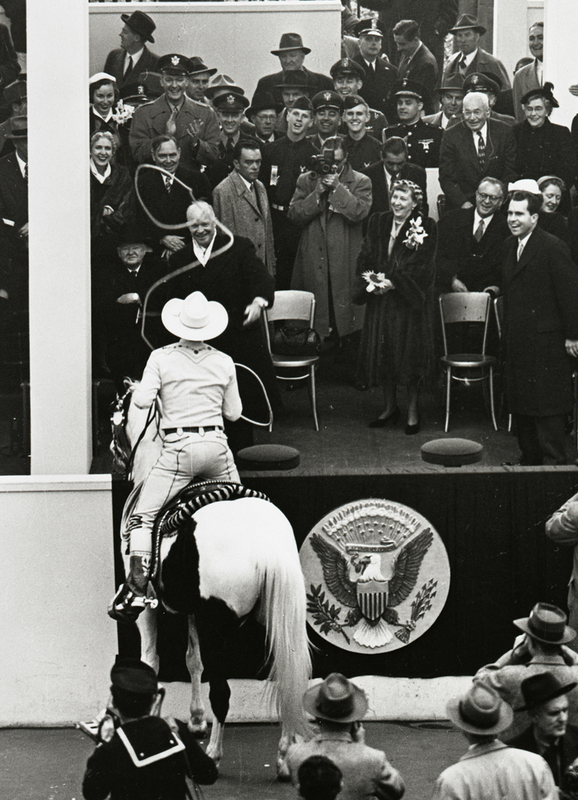 Jan. 20, 1953  To the consternation of the Secret Service, trick roper Montie Montana ropes President Dwight D. Eisenhower during his first inaugural parade. (Montie had secured the president-elect's permission beforehand.) At right, Vice President Richard Nixon seems to be enjoying the spectacle. This photo is cropped; click on image for full view. Montie moved in 1976 from Northridge to Agua Dulce. Ike is Lassoed by Cowboy in Parade. Associated Press | As published in Louisville (Ky.) Courier-Journal | Wednesday, January 21, 1953. 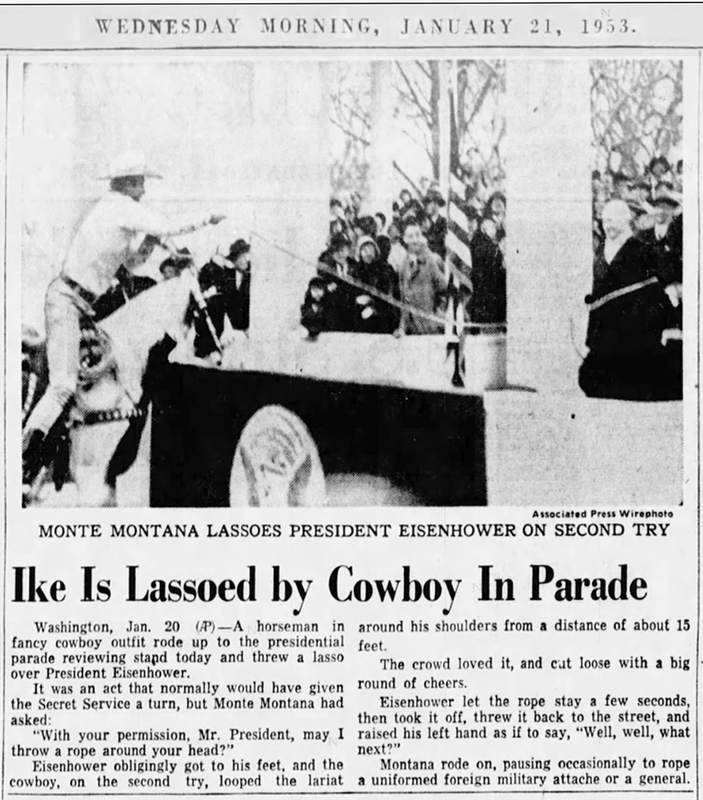 Washington, Jan. 20 (AP) — A horseman in fancy cowboy outfit rode up to the presidential parade reviewing stand today and threw a lasso over President Eisenhower. It was an act that normally would have given the Secret Service a turn, but Montie Montana had asked? "With your permission, Mr. President, may I throw a rope around your head?" Eisenhower obligingly got to his feet, and the cowboy, on the second try, looped the lariat around his shoulders from a distance of about 15 feet. The crowd loved it, and cut loose with a big round of cheers. Eisenhower let the rope stay a few seconds, then took it off, threw it back to the street, and raised his left hand as if to say, "Well, well, what next?" Montana rode on, pausing occasionally to rope a uniformed foreign military attache or general. LW2383: 9600 dpi jpeg from National Archives.